Wahoo fish are quite fast; they swim up to between 50 and 60 miles per hour and are one of the fastest ocean fish. They are predators to be reckoned with, especially given their excellent eyesight and viciously sharp teeth. Because of that, they’re a great and fun but difficult challenge for even pro anglers. They are often “surprise” catches because fishermen set out to target other fish and through happenstance, end up with wahoo. The typical wahoo reaches eight feet in length and weighs a whopping 108 pounds. Some catches have been as long as 8 feet 2 inches and up to 183 pounds. Their coloring is blue iridescent, and vertical blue stripes cross their silvery sides. Wahoos resemble king mackerels and Spanish mackerels but can be distinguished by their big blade-like tail fins. Wahoo live around the planet in many tropical and subtropical waters and are often available relatively close to land. 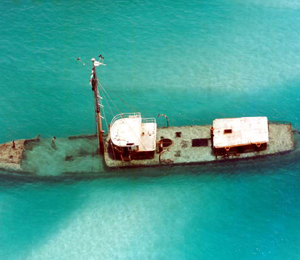 They have often been sighted in and around wreck sites. They are usually by themselves or in pairs or in groups of three fish. On occasion, they travel in schools of 100 individuals. Most wahoo have a giant stomach worm,Hirudinella ventricosa, living in their stomach, but it is harmless to the wahoo. Wahoo hit maturity between one and two years of age and spawn near Florida and in the Caribbean Sea. Peak spawning times are June and July, although the season runs from May to August. Wahoo prefer to feed at first light, although sunset and tide changes are also decent times for Wahoo to feed. They eat other fish, including tuna and dolphinfish, and squid. They gather in the open sea near drifting bits and pieces such as Sargassum weed. Wahoo like to sneak up on their prey and attack via a lunge. 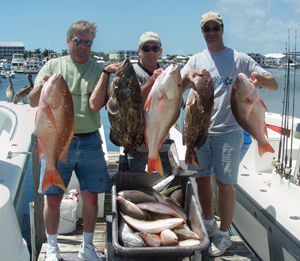 In Key West waters, they may work with other fish close to shore in order to capture prey. 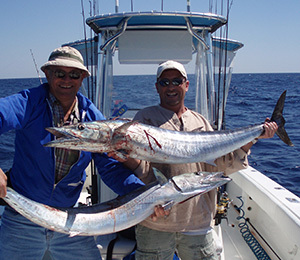 Some fishermen prefer to make a relatively long boat ride to fertile waters farther off Key West because the waters can be more fertile with wahoo. While the thinking to catch wahoo used to prioritize depth-friendly tackles over speed, that line of thought has changed somewhat. Since wahoos often take fishermen on long runs, the tackles must be able to handle the speed and strength. Sleek lures displace less water than flatheads and chuggers but also need the weight of a heavy cigar sinker. On the other hand, some anglers still practice depth strategies. They use big, strong live bait such as goggle eyes, herring and blue runners. These fishermen set bait layered at several depths separated by hundred-feet intervals. They use a large hook and let the bait drift or troll, although those using bait at layered depths must keep moving a little to prevent line tangles. With patience may come a wahoo reward. Since wahoo feed primarily at daybreak and at sunset, these are prime times to try to snag them, as are spawning months. Wahoo also come out with tide changes due to a full moon. 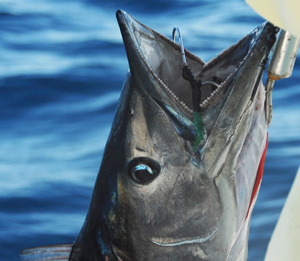 Fishermen should not worry about getting their hooks back right away after catching a wahoo. Boxing the fish and cutting (or unsnapping) the leader, putting on another wire and hook works fine. Keeping ample supplies of lures and baits around is a good move.